It has been awhile since a comic has focused upon the original stars of the Star Wars universe. This new series focuses upon Luke and Leia as they try to find a new base for the rebellion after the battle of Yavin IV. Meanwhile, Han Solo is flying off somewhere for vague reasons. In addition, we get to see what happened to Vader after his defeat at the Death Star. Post Yavin is a good place to start a story with the classic characters because it is a span of time where all problems cannot be solved by the Force or special effects. The biggest problem with this new series is the writing. 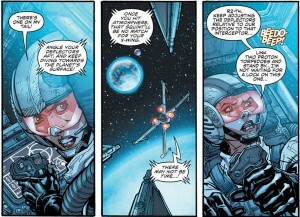 While, Brian Wood has done some great writing in the past, Star Wars does not seem to be his forte. He gets all the minutia correct, but it is more than just facts about the universe that make a good story. The dialogue feels stilted and often times the responses to previous statements do not make sense. It is also very annoying when narration captions inform the reader of things they already know such as the importance of the Death Star and Leia’s back story. At many times it feels like the comic is talking down the reader. While this may have been done to help bring in new readers there are plenty of better ways of handling the introduction process. One of the best aspects of this comic is the art. The characters are a little stylized, but they look like the characters from the movie. Everything looks just like it did back in 1977. The ships are all recognizable and look just as they should. There are only two fight scenes and they are both very short, it would have been nice to see the well drawn machines in extended action scenes. It is also nice to see some good detailing on both the planet and on the different ships. 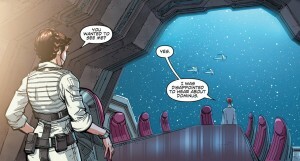 This comic may have some of the best art I have seen in a Star Wars comic in quite awhile. 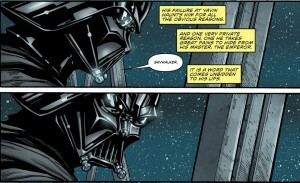 If you are a fan of Star Wars then you should read this comic. Despite the flaws it is an interesting entry into the saga and will likely improve over the next few issues. 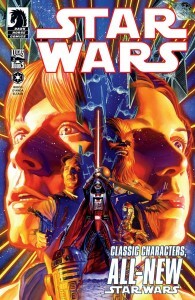 This comic feels a little weak to recommend to people who only have a passing interest in the series as it will not “wow” anyone who is not already excited about the idea of Luke, Han, and Leia back in action. In terms of Star Wars comics it is far from the worst, but there are much better titles out there such as the recently finished “Purge – The tyrant’s fist” which was excellent. Despite better series being available, this is a read that fans of the series may enjoy.